But sometimes it can when making your first pie. A home cook worth his or her salt understands the most basic of recipes can sometimes be the trickiest. Take pie crust. If you make the pastry right the first time, it’s probably because you got lucky. Or you had a good coach. Making an excellent pie crust–– one that is flaky, one that is crispy––is easy once you get the hang of it. But it may be difficult for first-timers because success is determined by nuance, which also makes it difficult to pen in a recipe. #1 Warmth of any kind is death to pastry dough. #2 Don’t over knead; your fingers must know when you’re done–when it’s not too wet and not too dry– and to leave the dough alone. 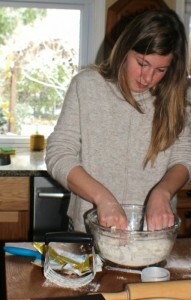 Making perfect pie crust insists upon experience dependent on repetition, touch, and focus. “Don’t fool around and get distracted,” Lucy warns, as I gather stray dishes and place them in the sink, then check my iPhone and stick it into the charger. Got it. . The rewards of crust confidence can’t be underestimated, and not only when creating desserts. Imagine chicken pot pie with homemade crust, or a savory paté en croute; imagine biting into one of Michigan’s beloved pasties encased in a homemade pastry. Here’s a fun link I discovered on the Saveur site with some of the most interesting savory pies I’ve seen. 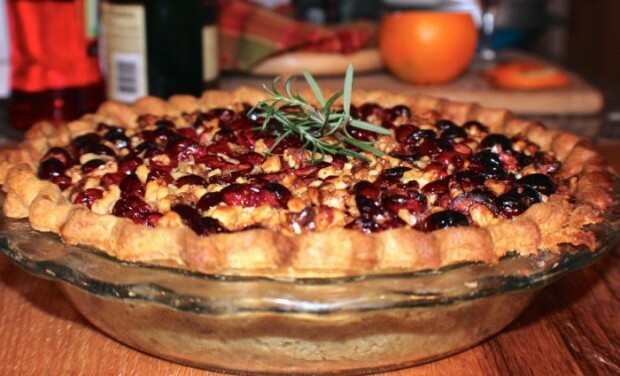 Lucy’s recipe for this Cranberry Pie with Bourbon and Walnuts is made with Westwind flour that is milled in Michigan. 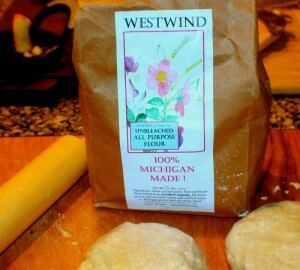 This is the flour they use to create some of their most savory concoctions at the diner. In a large bowl, combine the flour and salt. Toss the butter into flour and coat. With your fingers or a pastry cutter, work the butter into the flour, until all of the butter pieces are no larger than a pea. Wrap in wax or plastic paper and refrigerate at least an hour or up to 24 hours. (Could put in the freezer 20 minutes.) Note that if you skip this step the crust will shrink as it bakes. Make filling (recipe below) while dough is chilling. Preparation time: 15 active minutes plus 1-24 hours chilling time. Toss cranberries in sugar and macerate at least an hour and up to 4 hours. Whisk eggs and sugars together. Whisk in syrup, zest, vanilla, corn starch, walnuts, melted butter and whiskey. Reserve. Butter one deep-dish pie pan. Remove dough from refrigerator and on a floured work surface, roll out dough, outward from the center, as thin as possible without tearing crust. 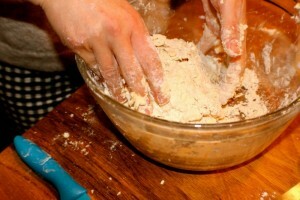 Rotate the dough when rolling adding flour to your work surface when needed to prevent the dough from sticking. If you get a small hole, pinch pastry together. (Note that if the dough is too firm to roll, let it rest at room temperature for a few minutes or give it a couple of whacks with a rolling pin.) 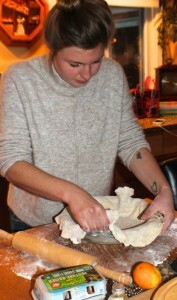 Place pastry in pie pan, gently easing into the corners and up the sides, and crimp edges. Pour cranberry mixture into pan. Place pan on parchment-lined sheet pan to avoid messy oven spills. Bake on center rack of oven 30-45 minutes or until toothpick pricked into the center of pie comes out clean. Pie should be golden brown; don’t allow crust to burn. (Pie will set up when cool.) Garnish with a rosemary sprig, if using. More Recipes Filed Under "Pies & cakes"